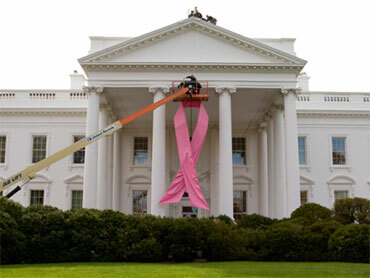 Earlier this week, the White House put up a giant pink ribbon over the front steps in recognition of Breast Cancer Awareness Month. Follow these “Top Ten” vital tips to help prevent Breast Cancer from occurring in the first place. This Health Alert is not just for women – men need to know this information too! 1. Get regular mammograms. It sounds obvious, but you’d be surprised how many women don’t. Earlier this month, an Australian study found that women who get regular mammograms had a 4.7 percent risk of dying of breast cancer; women who weren’t screened had a 56 percent mortality rate. Some women “hate” mammograms, I don’t like them either, see Tip #3 below. 2. Find out whether you or women close to you have “dense breasts”. What does this mean? It means the breast cells grow and multiply more rapidly, raising your risk. Plus dense breasts make it harder for a mammogram to “see” through the tissue and detect a tumor. While dense breast tissue is more common in younger women who haven’t yet had children, it’s also hereditary and can affect any woman. I have a dear 43-year-old friend whose breast tumor failed to show up on three years’ worth of mammograms before her doctor finally ordered an MRI. How to find out? Schedule a breast exam and ask your doctor. Also talk to the radiologist who’s administering your mammogram. 3. Ask your doctor to recommend other tests. Surprise: Mammograms are only 16 to 40 percent accurate, studies show. This powerful Thyroid-enhancing soup not only provides essential Iodine from Kelp sea vegetables to nourish the entire thyroid “factory”, but it is also high in amino acids and antioxidants and is practically a total meal in itself. This and other miso soups, when properly prepared, can have an extraordinary effect on one’s energy, leaving one calm yet alert. President Barack Obama this past weekend declared the swine flu outbreak a National Emergency, to cope with any surge of patients, the White House says. The declaration Saturday increased concerns, and panicky reactions, to a disease now affecting nearly every nook and cranny of the world. …only children with an impaired immune system are supposed to take the vaccine. In my office, I have been told by parent after parent that local health officials are coming into the elementary schools next week to administer the H1N1 vaccine to all of the school children. Now, it is obvious we need to protect our children – and ourselves. In last Friday’s health alert, Swine Flu Spreading from Schools, schools are a breeding ground for H1N1. But forced vaccination is not the right way to go about providing that protection. I think the risks far outweigh the “supposed” benefits. If you missed our video report on Desiree Jennings, a vibrant 26 year old who got a flu shot in August and is now neurologically impaired, you must watch it: Woman Neurologically Disabled by Flu Shot. If you have children, no doubt you have already know that schools are a breeding ground for germs. Locally our schools in Arkansas have reported up to one-half of the kids are home sick. When the kids get it, guess who’s next? Mom and Dad! Results of tens of thousands of flu tests indicate that the pandemic H1N1 virus is spreading from school-aged children to the rest of the U.S. population, makers of the tests say. Quest Diagnostics, which makes a commercially available test that can confirm swine flu infection, said the findings suggest many more adults will be infected with the new H1N1 influenza. “Based on tests performed since Quest Diagnostics began offering H1N1 testing in May 2009, children between the ages of five to 14 have experienced higher overall rates of H1N1 positivity than any other age group,” the company said in its report. The Quest test is a PCR test — it magnifies the genetic material of the virus so it can be detected and is similar to the tests used by state health departments to confirm H1N1. Far too many people suffer from chronic insomnia, tossing and turning all night and barely getting an hour or two of uninterrupted sleep. And this is not something to take lightly. The body not only needs 8 hours of deep sleep, it DEMANDS IT! When our sleep patterns are out of whack, we quickly will spiral out of control with irritability, uncontrolled anger, lack of concentration, chronic fatigue and even suicidal tendencies. Some people even boast about how little sleep they get! The plain truth and irrefutable fact is our bodies simply cannot function properly on less than 8 hours of sleep each night. This is the time the body recharges the adrenal glands, healing and regenerating itself. Nearly 99% of all nervous breakdowns get their origins in lack of adequate sleep. When I was the nutritional products formulator with Equinox International many years ago, I developed a formula called Tranquility that was consistently in the Top 5 best-selling formulas. At the time, it was the very first non-prescription alternative for a deep, restful night’s sleep. It wasn’t just one or two herbs to help you relax; it was a blockbuster of things that really induced restful, uninterrupted, rejuvenating sleep. Over the ensuing years, I’ve keep a battered notebook of new herbs and compounds to use “one day” for a new and improved version of this famous formula. Woman Neurologically Disabled by Flu Shot! What you are about to read and watch is the Nightmare Scenario that I and other believers in natural medicine and therapies predicted would happen with the Swine Flu Madness Campaign. If ever you needed a final straw that broke the camel’s back to prove that vaccines are dangerous, this is it – and it will only get worse, believe me. An Ashburn, Virginia woman is in the fight of her life after suffering a very rare side effect to the seasonal flu shot. The vast majority of doctors say flu shots are safe. In this case, the FDA says they found nothing wrong with this particular batch, but sometimes there are complications. That’s apparently what happened to Desiree Jennings, and now her life will never be the same. At 26 years old, Desiree Jennings was the picture of health. She’s a Washington Redskins cheerleader and an avid runner. Her life changed forever on August 23 when she says she got a seasonal flu shot at a local grocery store. Ten days after receiving the shot, she came down with the flu. After that, her health spiraled downwards. She started passing out and had to be hospitalized twice. “We went to an urgent care place and they wouldn’t even let her get out of my truck because she was seizing in the back so bad, so they called an ambulance immediately,” says her husband, Brendan Jennings. Doctors at Fairfax Inova and Johns Hopkins diagnosed her with a rare neurological disorder called dystonia. They think it was caused by a severe reaction to the flu shot. Desiree now has difficulty speaking, walking, and even eating. During an interview with FOX 5, she had several seizures. The effects are irreversible. “The symptoms will get worse if I use my voice or walk when the brain signals are misfiring,” says Jennings. Breakfast of Champions to Fight Thyroid Cancer? What follows below is an unsolicited report from the front lines in the fight against cancer. It comes from a wonderful person, a very close friend, whose mother just last week was “treated” for a major thyroid cancer. Read her story describing the procedure and post-op, detailing the madness of the medical profession’s thinking and the lack of even basic nutritional knowledge of how to heal someone. Read it and weep – I did. My mother, as you know, has been diagnosed with cancer once again. As an 8-year Breast Cancer “Survivor” it was quite a shock to the family when we were told cancer had returned. She opted to go the “Doctor” route and have invasive surgery once again, this time having her Thyroid totally removed. Out of respect for my mother’s wishes, even though I didn’t agree with her choice, I supported her decision and set out to take care of her in her time of need. My mother was asked about any products she had been taking prior to the surgery. She was taking Prozac and a well-known cancer drug, which didn’t raise any concerns, but when she mentioned she was taking your Life Transfusion Liquid Mineral Complex and your Miracle of Life formula, the 23 year old doctor’s assistant launched into a long dissertation about the dangers of these potentially toxic (all natural!) products that could cause additional risk to the ultimate outcome of her surgery. I wanted to jump out of my seat and strangle him. Trust for America’s Health (TFAH) released a new report last week that finds 15 states could run out of available hospital beds during the peak of the outbreak, if 35 percent of Americans were to get sick from the H1N1 flu virus. Twelve additional states could reach or exceed 75 percent of their hospital bed capacity, based on estimates from the FluSurge model developed by the U.S. Centers for Disease Control and Prevention (CDC). The study, H1N1 Challenges Ahead, based on estimates from a computer model developed by the U.S. Centers for Disease Control and Prevention, shows the strain hospitals and health departments could face as a second wave of swine flu surges. “Our point in doing this is not to cry Chicken Little but really to point out the potential even a mild pandemic can have and how readily that can overwhelm the healthcare delivery system,” Jeffrey Levi, director of Trust for America’s Health, which sponsored the report, said in a telephone briefing. According to the report, the number of people hospitalized could range from 168,025 in California to 2,485 in Wyoming, and many states may face shortages of beds.